Empowering people to move to a desired state of youthfulness and health..
Want to Add 7.5 years to your Life? Yale University long-term Study (over 23 years) on how a positive, attentive, youthful state of mind can reverse or stall the aging process. The research found that older individuals (50 plus) who had a positive self-perception of aging lived 7.5 years longer than those with less positive perceptions of aging. Your chance of getting cancer in your lifetime is approaching 70%. Breakthrough Anti-Aging Mind Body neuroscientific research confirms that you CAN RESET YOUR BIOLOGICAL CLOCK BACK INTO A BETTER FUTURE!! 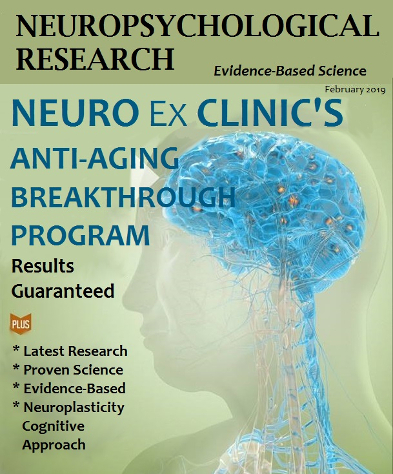 Neuro Exs Clinic's Self-Transformational, Anti-Aging Program is a step-by-step, experiential program that is taught from a platform of perceptual self-awareness. Techniques used in the Treatment Program are based on cognitive neuroplasticity therapy*, which rewires the brain's limbic system to re-build and strengthen the functional neural pathways relating to youthfulness, health and well-being. *Cognitive neuroscience is a relatively new field which bridges the gap between the study of complex behaviors (psychology) and the study of neural processes (neurosciences). One specialist area of study by Cognitive Neuroscientists / Neuropsychologists, which is the focus of the Clinic's Treatment Program, is understanding how deep perception (accessing the subconscious mind's theta brainwaves) and experiential mental exercises can stimulate neural re-growth that generates change in the brain-mind-body continuum. When Anti-Aging Studies Meet Cancer Chemoprevention: Can Anti-Aging Agent Kill Two Birds with One Blow? Recently published articles from Ageing Research Reviews. The most downloaded articles from Ageing Research Reviews in the last 90 days. Ageing and Parkinson's disease: Why is advancing age the biggest risk factor?